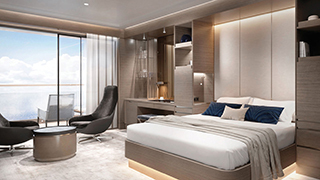 A rendering of a Ritz-Carlton yacht. Sleek, spacious and refined accommodations. Put the words ‘Ritz’ and ‘Carlton’ at the front of just about any sentence, and incredible levels of luxury immediately spring to mind. Put them in front of the words ‘yacht’ and ‘collection’— and the luxury barometer goes off the scale! So it was an excited crowd of 55 travel professionals that attended an informative Ritz-Carlton Yacht Collection lunch at Vancouver’s stylish JW Marriott Parq this week. 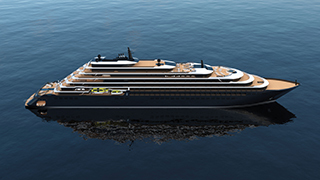 There were audible ‘oohs’and ‘aahs’ from the crowd as Angela Composto, Ritz-Carlton Yacht Collection’s VP of sales and marketing, revealed details about the company’s first yacht. 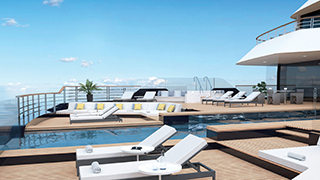 At 624-feet, the first Ritz-Carlton yacht will feature 149 suites and host 298 guests. Her 2020 inaugural season will include the Caribbean (February and March), Mediterranean (April to June), Europe (July to September), Canada and New England (September and October) and the Caribbean (November and December). Show-stopping features include suite design notes by the firm Martínez Otero, who has designed retail stores for luxury brands such as Prada, James Bond-style tenders that operate at 20-knots instead of eight (the same tenders that Russian businessman Roman Abramovich has on his super-yacht Eclipse), an uber-stylish ‘Living Room’ embarkation area, water sports platform and five restaurants. One of the restaurants, Aqua, is an exclusive 30-seat eatery delivered by three-star Michelin chef Sven Elverfeld. Elverfeld is the only chef who has held three stars for 10 years running, and it is hoped that Aqua will become the world’s first floating Michelin-starred restaurant. “This yacht brings something new to the marketplace that just doesn’t exist,” Composto told Open Jaw.“People ask me all the time: Who is your competitor? Who can we compare this too?And it’s really hard, because there isn’t another ship like her. That means that there’s a whole new target market with a whole new set of requirements and preferences for cruise specialists to understand. “We’ve done extensive research and we know that we’re bringing people who are new to cruise to the market. That also brings a new customer to the travel agent that they didn’t have before. 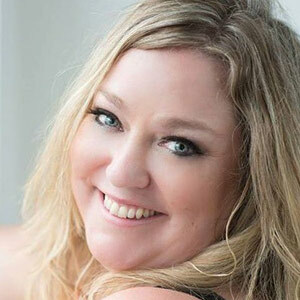 “Yes, the typical luxury cruise customer is a little older, they have more time and more income and they can take a longer vacations, so luxury cruise offerings are normally around 14 or 21 days. 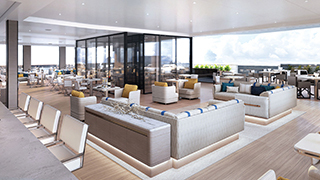 It appears that Ritz-Carlton has strong understanding of this new market of younger, high-end cruisers, as plans are already underway for two more yachts to launch for 2021 -- despite the fact that sales for the first yacht have been open for less than a month. “We opened for reservations three weeks ago to our rewards members,” said Composto. “We turned on the phones at 8.15 in the morning in preparation for an 8.30 start. By 8.22 the phonelines were all lit up and going — and they haven’t stopped yet.